The Richmond family are well known for their generous mannerisms. Due to the families historscope being aligned with Jupiter, the planet of charisma, The Richmonds can often be complex and imaginative. They reflect changes in their own surroundings and can often become over optimistic and materialistic. ACCORDING to the best authorities in genealogical research, the Richmond Family that has been so conspicuously identified with English history for nearly eight centuries, and whose members have acquitted themselves at all times bravely and brilliantly, had its origin in Brittany, France. Like most names of families, in England as well as elsewhere, the word was originally a designation of place. In its native language it was derived from the words riche and monte or monde. 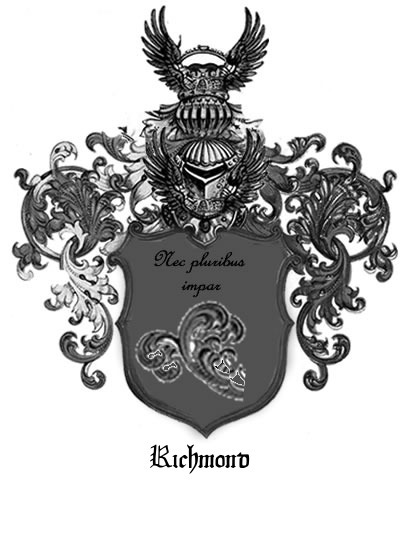 There is now a prominent French family of the name of Richemonte that sprang from the same stock, and it has been noted as an interesting example of heredity that its members bear striking resemblance to those of the English and American Richmond lines. 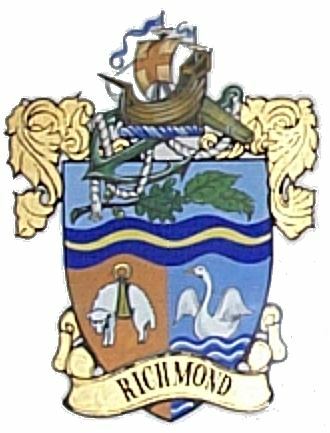 After the name was adopted as a surname it was variously spelled, in the early English history of the family, as Rychemonde, Richemount, Richemonte, etc. The Richmond’s from whom the American branch was derived have been traced in English history to the time of the Norman invasion. 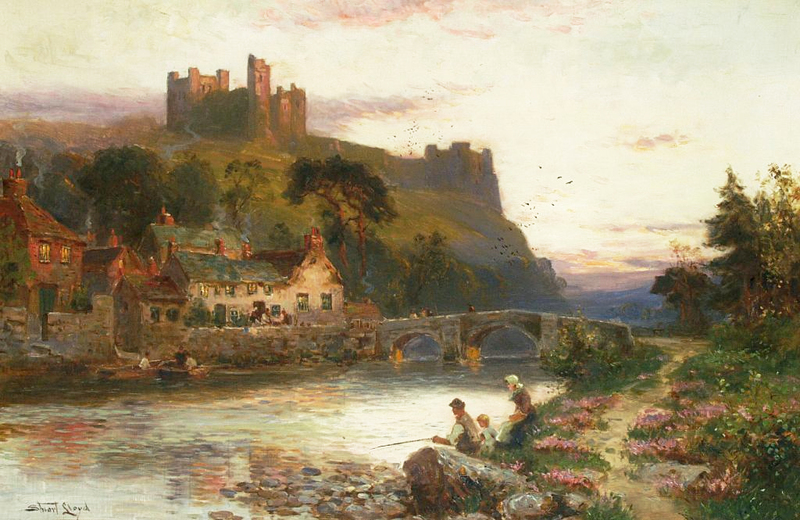 For several centuries these early progenitors, generation after generation were notably associated with the great events of the kingdom, and much of their early history was closely entwined with that of the famous Richmond Castle. From Richmondshire, where the English family originated, branches of it spread to other parts of England, in which its members achieved much distinction and became foremost in the affairs of their successive generations. One of these renowned British lines was that of Ashton-Keynes, whence came John Richmond, who emigrated to America in 1635 and founded the family that has enjoyed prominence in various branches on this side of the Atlantic during more than two and one-half centuries. Although some authorities express uncertainty as to whether John Richmond was born in Ashton-Keynes, Radborne, or Christian Malford, he was certainly of Wiltshire. There is no doubt among genealogists who have given attention to the derivation of the English stem that the Wiltshire Richmond’s were descended from the Yorkshire Richmond’s, who came to England with William the Conqueror. Representatives of the family were first settled in Yorkshire on lands given to them by the king. In a later generation a younger branch went over into Wiltshire, and from that cadet line came the American offshoot. In the northwest corner of Yorkshire, England, in the district of Richmondshire, stands Richmond, the ancient market and parish town, two hundred and thirty-four miles from London. 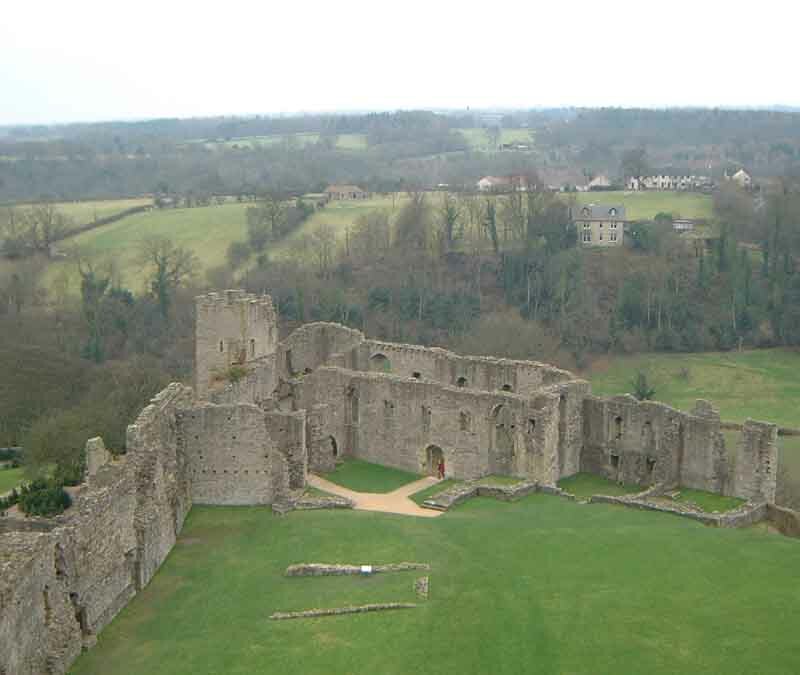 Richmond is famous for the ruins of its great castle, which, as well as the town, was built by the first earl, Alan the Bed, son of Hoel, count of Brittany. The place derives its name—etymologically, rich mount or rich hill,—from the beauty of the elevation on which it rests. In the early Norman times it was the chief locality and feudal capital of the district of Richmondshire. Until the end of the feudal system the Richmond Castle, which dominated the town, both as regards its location and in the fact that it gave general distinction to the place, was one of the strongest inland fortresses existing anywhere in England. The earls of Richmond, who also were dukes of Brittany, were the wealthiest and most powerful among the nobles of Yorkshire. No section of Great Britain is more picturesquely beautiful than the country immediately surrounding the town of Richmond. Bold rocks are everywhere conspicuous in the landscape, clothed with trees and shrubs. From the hills about are charming prospects in all directions. The castle, which still makes the town noted, although situated one hundred feet above the Swale River, seems from the hills to be sunken in a deep valley. The eye ranges over the extensive plains of the vale of York far away to the eastern and western moors. Richmond Castle in Richmond, North Yorkshire, England, stands in a commanding position above the River Swale, close to the centre of the town of Richmond. It was originally called Riche Mount, ‘the strong hill’. The castle was constructed from 1071 onwards as part of the Norman Conquest of Saxon England as the Domesday Book of 1086 refers to ‘a castlery’ at Richmond in that year. 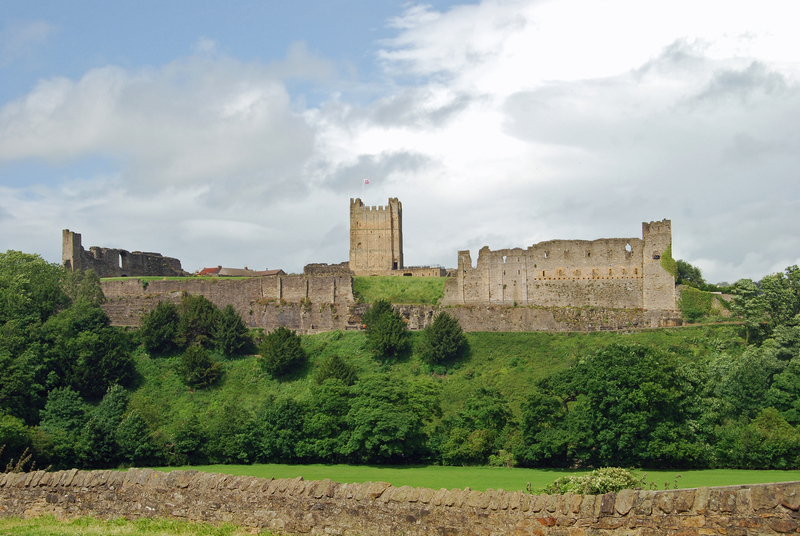 Richmond Castle was not mentioned by name in the Domesday Book, and no reference to it is found in the early annals. In the recapitulation of the Domesday Book the statement is made that Earl Alan has one hundred and ninety-nine manors in his castelary, which goes to show that the castle was then in existence. It is a matter of record that during the life of William the Conqueror Earl Alan gave the chapel from the Castle of Richmond to the Abbey of St. Mary of York, which he had founded. 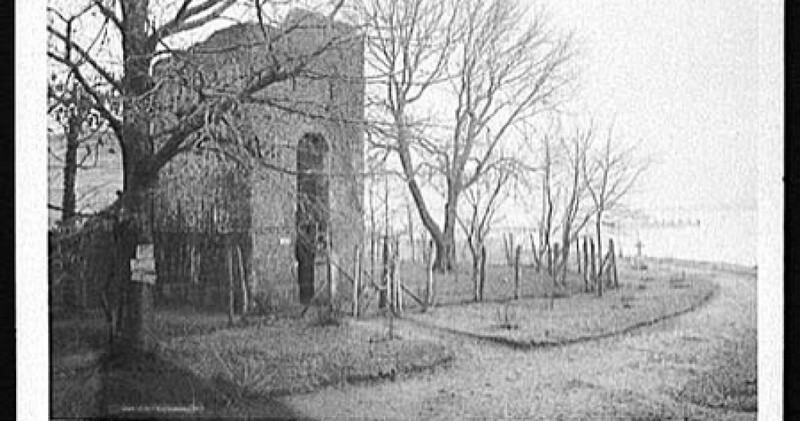 Accordingly the castle must have been in existence at the date of the Survey, inasmuch as that was only a year before the death of William. 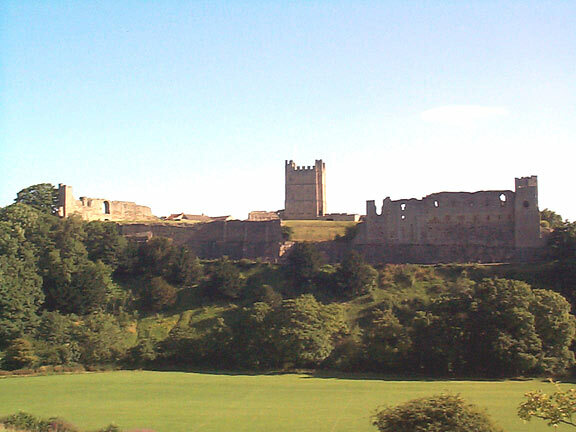 Situated on the south side of the town, Richmond Castle overlooks the Swale River which runs in a deep valley at the foot of the hill where the ruined structure stands. Between the river and the site of the castle, and about six hundred feet perpendicularly above the bed of the Swale, is a walk from eight to nine feet wide. From this walk one gets a sense of the great elevation of the site and the castle above the immediately surrounding land. Farther above the walk some forty or fifty feet is the ground on which the castle stands. On the side toward the river the elevation is faced with massive stones made to resemble a cliff of natural rock. On the eastern side of the castle yard the Swale also skirts the property. At the latter spot, however, the descent is not as precipitous as on the south; there is a downward gentle slope to the river for a distance of some forty to fifty yards. The west side of the once almost impregnable fortress faces a deep valley, the ascent from which to the castle is exceedingly steep. Approach from this point, in the period when the castle was indeed a fortress, must have been well-nigh impossible. On the north the site of the castle is elevated only slightly above the level of the town, and it was from this side only that it could have been accessible to an attacking enemy in the good old feudal times. Alan, duke of Brittany, who founded the Richmond line, was not a son or nephew of William the Conqueror, as some authorities have asserted, but was his second cousin. The first earl of Richmond was not Alan Fergeant. He and his brother Eudo were grandsons of Conan Tortus. 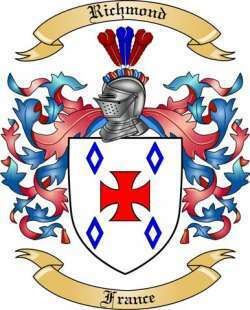 Eudo had six sons, among whom were Alan Rufus, Alan Niger, and Stephen. Alan Rufus was the first earl of Richmond, but dying without issue Alan Niger succeeded to the title, being duke of Brittany as well as earl of Richmond. For several generations the earldom and Richmond Castle remained in the possession of the descendants of its founder. In the succeeding centuries it was given to other owners and attracted again and again by the sovereign. In 1436 the earldom reverted to the crown and continued in possession of the king until Edwin, half-brother of Henry VI., was created earl of Richmond. His wife was the celebrated Margaret of Richmond, and their son, who succeeded to the throne as Henry VEL, took the inheritance of Richmond and kept it for his life. In 1525 Henry VIII. conferred the earldom upon his natural son, Henry Fitzroy, with the title, which was then created, of duke of Richmond. Henry Fitzroy died without issue and the title slept until 1613, when the earldom was revived by James I. The title and estate are now held by the Lenox family. They were conferred upon Charles Lenox, the illegitimate son of Charles II., who was created first duke of Richmond in 1675. Thus the title has experienced numerous vicissitudes, and the lineages of various noble families, totally unrelated to one another, at least in primary respects, and especially unrelated to the true Richmond lineage of original descent, have become associated with it by the circumstance of purely arbitrary creations in the course of the centuries. Conan IV., earl of Richmond, was born in July, 1138. He succeeded to the title as the fifth earl, March 30, 1146, and married Margaret, a sister of Malcolm IV., king of Scotland. His daughter Constance, countess of Richmond, was born in 1163. She was patroness of St. Mary’s Abbey, York; Jowauex Abbey; Rowney Nunnery, County Hertford; Abbey of Carnoet and Coetmaleon; she died September 4, 1201. The ancient coat of arms of the Richmond Family (A. D. 1066) is Gules, three bars gemeles or, a chief argent. Motto: Resolve well and persevere. These arms are now borne by the Cumberland Richmond’s. 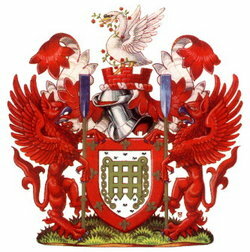 According to Burke’s “General Armoury,” the arms of the Yorkshire Richmond’s are Two bars gemeles or, a chief argent. The later coat of arms of the Richmond’s, to which the family of Richmond, alias Webb of Stewkly, Buckinghamshire, and of Redborn and Wiltshire, are entitled, is Argent, a cross patonce fleury azure, between four mullets gules. Crest—a tilting spear argent, headed or, broken in three parts, one piece erect, the other two in saltire, enfiled with a ducal coronet. Motto—Resolve well and persevere. 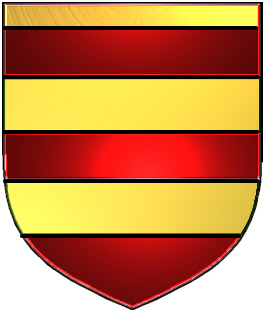 One family substitutes for the four mullets in the coat of arms four estoiles. 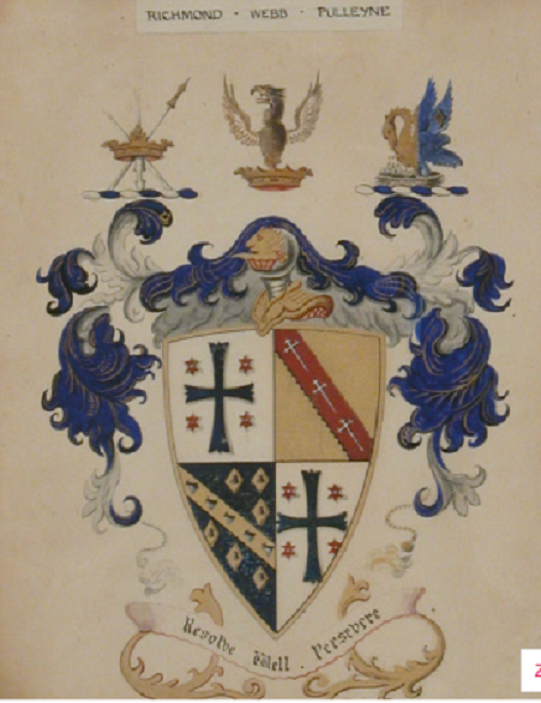 According to Burke’s “Seats and Arms,” the crest was won by Sir Philip Richmond by a feat of arms in single combat with a Saracen prince during the crusades, before Jerusalem, in the presence of Richard L, Coeur de Lion. The ducal coronet in the crest may have come from the family being of lineal descent from Edward L, or it may have been derived from Alan Rufus, the first earl of Richmond, or from some other ducal alliance in later generations. Authorities differ on this point. First of record in the line of English ancestors leading to the American Richmond Family, of which Dean Richmond was the foremost representative in the last generation, was. Roaldus Musard de Richmond, who was with William the Conqueror at Hastings. He was one of the most powerful leaders accompanying the Norman invader into England in 1066. Hasculfus Musard de Richmond, son of the preceding, held in demesne Keddington and Chilworth, Oxfordshire, Stainbury, Gloucestershire, and other lordships at the time of the General Survey, according to Dugdale. Roaldus de Richmond, le Ennase, son of the preceding, was second constable of Richmond Castle under Alan in., earl of Richmond; he was seized of lands in Skeeby and Croft, by the gift of King Henry, who likewise gave him the manor of Pickhall, and other holdings, which he in turn gave in marriage with a daughter to Jolanus de Neville. He was lord of Burton, Aidborough, and most of his uncle Emsart’s lands, by a grant of King Stephen, Emsart being the first constable of Richmond. He founded an abbey on his manor of Easby in honor of St. Agatha in 1152, and there he was buried with his wife, Graciana. Sir Alan, son of Roald de Richmond, was the third constable of Richmond Castle. In the first year of the reign of Richard L, 1189, he owed the king two hundred marks for the custody of the castle. In the fourth year of the reign of Richard L, 1193, he paid ten marks and owed one hundred and ninety. In the third year of the reign of Richard I., he as surety for Walter de Lasselles. In the second year of the reign of John, 1201, he gave the king three hundred marks, and three palfreys to be constable of Richmond Castle, to hold the same for himself and his heirs. Soon after he was diseased, but in the ninth year of John, 1208, he gave the king two hundred marks and four palfreys to have the castle again and with it the king’s letters patent granting him military jurisdiction. Sir Roald de Richmond, son of the preceding, was the fourth constable of Richmond Castle. In 1208 King John gave to him various lands, including the manors of Caldewell, Croft, Kipling, and others, and also a mill and lands in Skeeby. The letters patent granted these lands to him and his heirs forever. He entailed the manors of Burton, Aldeburgh, and Croft upon his son Roald in the latter part of the twenty-fourth year of the reign of Henry III., 1240. Alan Richmond de Croft, son of the preceding, received from his brother the manor of Burton. He claimed lands in Roppele, Clareworth, Wurthington, and Newland, county of Lincoln, in right of his wife, in the forty-third year of the reign of Henry HI., 1259. He married Mathilda, daughter and coheir of Peter de Goldington and coheir of Simon de Roppele, lord of Roppele, Lincoln County, of the time of Edward I. 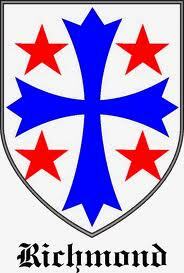 Sir Roald Richmond de Croft, son of the preceding, received from his uncle Roald the manors of Caldwell and Croft. He died in the forty-sixth year of the reign of Henry III., 1262. One authority (fn7 “Honores de Richmond,” Gales.) makes this Sir Roald to have been the son of Sir Roaldus de Richmond, fifth constable, brother to Alan, son of Roald de Croft. Sir Roald Richmonde de Croft married Isabella, daughter and heir of Robert, son of Osanna de Langthwayt, by Isabella his wife. Eudo de Richmond, son of the preceding, had possessions in Staynwriggis, county of York. Elyas de Richmond, son of the preceding lived during the reign of Edward III. (1327-77). Elyas de Richmond, son of the preceding, lived during the reigns of Edward III. and Richard H. (1327-99). His brother, Richard de Richmond, succeeded him, and married Elizabeth, daughter of William de Burgh, lord of Burgh. Upon Richard and his wife Elizabeth William de Burgh entailed the manor of Burgh near Catterick, County York, in the twenty-third year of the reign of Edward III. (1350). Thomas de Richmond, son of Richard de Richmond and his wife Elizabeth, was living in the times of Richard, Henry IV., and Henry V.
William de Richmond, son of the preceding, lived at Draycott. He married, about 1430, Alice, daughter and heiress of Thomas and Elizabeth (Nicholas) Webb of Draycott, Wilts County. Upon his marriage he assumed the name of Webb and quartered the Webb arms. William Richmond, alias Webb of Draycott, son of the preceding, married Joan Ewen, daughter of John Ewen of Draycott. His will was dated April 24, 1502. William Richmond, alias Webb of Stewkley Grange, Bucks County, married, 1st, Dorothy Lymings, daughter of John Lymings of Notts County, and 2d, Marjory Choke, daughter of John Choke of Shelborne, Wilts County. He was living in Wilts in the reign of Henry VIII., for he is recorded as having bought lands there in 1541 and 1545. Edmund Richmond, alias Webb of Durnford, Wilts County, was living in 1575. He married Mary Weare, daughter of Robert Weare, alias Brown of Marlborough. Henry Richmond, alias Webb, son of the preceding, lived at Christian Malford, Wilts County. He was married four times and had twenty-five children. From this Henry Richmond are descended the Richmond’s of Ashton-Keynes, England. The manor of four hundred acres, and the entire village of Ashton-Keynes, once belonged to this branch of the family. In the eighteenth century the manor house was the home of Oliffe Richmond. In 1768, by marriage of Bridget Richmond (granddaughter of Oliffe Richmond), to Edward Nichols, the property passed into the possession of the Nichols Family, and in 1856 it was sold to the duke of Cleveland. “On the night preceding one of the engagements, Henry, his brother, went into the camp of the other army, eluding the vigilance of the sentry, and reached John’s tent, in the hope of enjoying an affectionate interview, previously to the uncertain events of the morrow. On entering the tent, John, alarmed at the sudden appearance of a stranger, as he conceived Henry to be, rose upon his bed and shot him dead on the spot.” Some authorities say that John Richmond killed himself in remorse for this act, while others have it that he abandoned the family estates and fled to parts unknown. There were fragmentary rumors that he exiled himself and engaged in business pursuits under another name in the northern part of England. However that may have been, an interesting speculation, that seems to have much of soundness and reason in it, connects him with the American Richmond’s, as will now be seen. I JOHN RICHMOND, the first American ancestor, was born about 1594 in Ashton-Keynes, Wiltshire, England. He was a man of affairs and ample means when he came to the new world in 1635, and he settled in Taunton, Mass., of which place he was one of the founders. He became a large land-owner and acquired considerable wealth. In the original purchase of Taunton, 1637, he owned six shares. He was absent from Taunton a great deal of the time, being recorded in Newport and elsewhere in Rhode Island. It is known he was in Rhode Island in 1655 and was a commissioner from Newport at the court of commissioners held at Portsmouth, R. L, in 1656. In the manuscript of the Rev. Legh Richmond a tradition is recorded that the John Richmond of Ashton-Keynes, who shot his brother Henry Richmond, came to America in 1635 and engaged in business. Joshua Bailey Richmond, in his work, “The Richmond Family, 1598-1896, and Pre-American Ancestors, 1040-1594,” refers to this tradition and says in connection with it that nothing is definitely known concerning the American John Richmond between the years 1643 and 1655. He thinks that this John Richmond may have been the John Richmond who came to Saco, Me., in 1635, and that he may have returned to England and engaged in the Civil War. He was called Colonel, which circumstance might also tend to identify him with the John Richmond of the Civil War. He died in Taunton, March 20, 1664. He was married in England, although no record of his marriage has been found as yet. 1. John Richmond, b. 1627; of whom below. 2. Edward Richmond of Newport, R. L, b. about 1632, d. November 1696. He was an incorporator of Little Compton, R. L, 1674; general solicitor, 1657-69-70-2; attorney-general, 1677-8-980; deputy to the general court, 1678-9, and a lieutenant and captain of the militia. M., 1st, Abigail Davis, daughter of James Davis; 2d, Amy Bull, daughter of Henry and Elizabeth Bull. 3. Sarah Richmond, b. about 1638, d. 1691. M., 1st, Edward Rew; 2d, James Walker; 3d, Nicholas Stoughton. 4. Mary Richmond, b. 1639, d. 1715. M. William Paul of Berkeley, R. I. 1. JOHN RICHMOND, son of the preceding, was born in Ashton-Keynes, Wiltshire, England, about 1627. He was brought to this country by his father in 1635 and became prominent in Taunton, Mass., where he maintained his residence during his entire life. He was a member of the town council, 1675-6 and 1690. He was also a constable, commissioner, and surveyor, and for more than half a century was a member of every important committee and commission appointed to deal with the business of the town and colony. He was especially interested in many purchases of land from the Indians in Massachusetts and Rhode Island. It is supposed (but not certainly known) that he had two wives, the first of whom does not appear of record. Died October 7, 1715, at Taunton. Married (2d) Abigail Rogers, daughter of John Rogers of Duxbury, Mass. She was born in 1641 and died August 1, 1727. Thomas Rogers, who came over in the “Mayflower,” d. in 1621. He had these children: 1. Joseph. 2. John. John Rogers, son of Thomas Rogers, b. in England; in Plymouth Colony in 1638, and later became a resident of Duxbury, Mass. ; in 1657 was a representative to the general court of the colony from Duxbury; d. 1692. M., April 6, 1639, Anna Churchman. 1. Mary Richmond, b. June 2, 1654, in Bridgewater, Mass., d. March 5, 1732. M., January, 1679-80, Richard Godfrey of Taunton. 2. John Richmond, b. June 6, 1656, in Bridgewater, Mass., d. September 20, 1672. 3. Thomas Richmond, b. February 2, 1659, in Newport, R. I., d. September 14, 1705, in Middleboro, Mass. 4. Susanna Richmond, b. November 4, 1661, in Bridgewater, Mass., d. August 18, 1725. M., April 18, 1683, James Reed. 5. Joseph Richmond, b. December 8, 1666, in Taunton, Mass. M., June 26, 1685, Mary Andrews of Taunton. 6. Edward Richmond, b. February 8, 1665; of whom below. 7. Samuel Richmond, b. September 23, 1668, in Taunton, Mass., d. 1736. M. 1st, December 20, 1694, Mehitable Andrews; 2d. Elizabeth (King) Hall. 8. Sarah Richmond, b. February 7, 1670-1, in Taunton, Mass., d. November 27, 1727. M., October 6, 1699, James Walker. 9. John Richmond, b. December 5, 1673, at Taunton, Mass. M., November 28, 1709, Harriet Otis. 10. Ebenezer Richmond, b. May 12, 1676, at Newport, R. I., d. 1729. M. Anna Sproat. 11. Abigail Richmond, b. February 26, 1678, d. February 23, 1763. M., July 29, 1708, Nathan Walker. Ill EDWARD RICHMOND, son of the preceding, was born in Taunton, Mass., February 8, 1665. He died in 1741. Married, 1st, Mercy; 2d, Rebecca Thurston; 3d, Mary. 1. Mercy Richmond, b. 1693 in Taunton, Mass., d. January 27, 1760. M. Edward Walker. 2. Edward Richmond, b. 1695 in Taunton, d. February 16, 1771. M., 1st, Elizabeth R. Deane; 2d, Elizabeth (Shaw) Sampson. 3. Josiah Richmond, b. 1697; of whom below. 4. Nathaniel Richmond, b. about 1700 in Taunton; killed in the Louisburg expedition. M., November 2, 1732, Alice Hackett. 5. Seth Richmond, b. in Taunton. M. Lydia Haskins. 6. Phoebe Richmond, b. 1706 in Taunton, d. March 9, 1741-2. M. Noah Elliott. IV JOSIAH RICHMOND, son of the preceding, was born in Taunton, Mass., in 1697. He died in 1763. Married, 1st, Mehitable Deane, daughter of Benjamin and Sarah (Williams) Deane and granddaughter of Walter Deane, who emigrated from England. She was born June 6, 1697, and died February 5, 1745. Married, 2d, Lydia (Eddy) Crocker. 1. Mary Richmond, b. in Middleboro, Mass., d. 1785. M., January 6, 1738, Captain Philip Leonard. 2. Josiah Richmond, b. 1711; of whom below. 3. Gershom Richmond, b. in Middleboro. M., July 30, 1747, Phoebe Richmond, who d. 1803. 4. Benjamin Richmond, b. 1727 in Middleboro, d. February 27,1803. M., 1st May 30,1751, Silence Deane; 2d, Lydia (Hall) Comstock. 5. George Richmond. M., October 5, 1751, Hannah Caswell. 6. Miriam Richmond, b. in 1732, d. 1813. M., 1st, Elisha Walker; 2d, Samuel Ray. 7. Lemuel Richmond, b. 1733 in Middleboro, d. April, 1802. M. Molly (Richmond) Lincoln. 8. Ephriam Richmond, b. February 12, 1735, in Middleboro, d. October 14, 1816. M., March 27, 1766, Ann Deane. 9. Eleazer Richmond, b. February 27, 1737 in Middleboro. d. February 27, 1802. M., December 5, 1765, Deborah Barrows. 10. Zeriah Richmond, b. in Middleboro, d. in Athens, Vt. M.,November 2, 1772, Jeremiah Tinkham, Jr., one of the first settlers of the village of Athens. 11. Mercy Richmond, b. in Middleboro d. about 1811. M., December 5, 1747, Benjamin Hackett. 12. Mehitable Richmond, d. young. V JOSIAH RICHMOND, son of the preceding, was born in 1711 in Middleboro, Mass. He died in 1785. Married, June 9, 1743, Elizabeth Smith of Middleboro, who died in 1803. 1. Edward Richmond, d. May 26, 1748. 2. Phoebe Richmond, b. in Taunton, Mass. M., November 10, 1768, Job Townsend of Taunton. 3. Josiah Richmond, b. May, 1747; of whom below. 4. Mercy (or Mary) Richmond, b. in Taunton, d. July 21, 1784. M., June , 1774, Mathew Briggs of Dighton, Mass. 5. Walker Richmond, b. 1753 in Taunton, d. June, 1835. M., March, 1775, Mary Waldron of Dighton. 6. Edward Richmond, b. March 14, 1756, in Taunton, d. October 15, 1826. M., March, 1781, Olive Briggs, daughter of Eliakim Briggs of Dighton. 7. Nathaniel Richmond, b. April 13, 1766, in Taunton. M., 1st, about 1782, Mary Horswell of Fall River, Mass. ; 2d, January 31, 1788, Abigail Wood of Middleboro; 3d, July, 1809, Azubah Cobb. 8. Abner Richmond, b. about 1769 in Taunton, d. April 18, 1813, in Barnard, Vt. M. Betsy Holmes daughter of Gershom Holmes of Plymouth, Mass. 9. Priscilla Richmond. M. Joseph Pierce. 10. Elizabeth Richmond, b. in Taunton, Mass. M., 1777, Asa Stephens of Dighton. 11. Hannah Richmond, b. in Taunton. M., 1st, 1781, Joseph Ware; 2d, 1790, Zephaniah Talbot. VI JOSIAH RICHMOND, son of the preceding, was born in Dighton, Mass., in May, 1747. He received from his father’s estate a farm in Middleboro, Conn. This he sold in 1792, removing to Barnard, Vt. From there he went to Salina, now Syracuse, N. Y., in company with several of his brothers and other members of the family. During the Revolutionary War he was a soldier in the New York line. He saw much active service, and was taken prisoner, being carried to the island of Bermuda, where he was held captive until finally exchanged. It is told of him, in the annals of the family, that upon his discharge from the military service at the close of the war he was paid in continental money, and being very hungry that morning, gave forty-eight dollars of his hard-earned pay in the depreciated currency for his breakfast. He died May 28, 1821. Married Betsy Hathaway, daughter of Shadrach Hathaway of Elizabethtown, N. J. She was born about 1750 and died in 1835. 1. Betsy Richmond, b. 1770 in Taunton. M. Job Richmond. 2. Hathaway Richmond, b. 1772 in Taunton; of whom below. 3. Edward Richmond, b. 1774 in Taunton, d. in Evansburg, 0. M., 1st, Martha Nott; 2d, Sally McFarlane; 3d, Miss Bedell; 4th, Miss Atchison; 5th, Miss Harger. 4. Sarah Richmond, b. 1776 in Taunton. M., 1799, Richard Cheedle. 5. Josiah Richmond, b. in Taunton; drowned at the age of twenty. 7. Phoebe Richmond, b. in Taunton. M., 1st, James Nott; 2d, John Finley. 8. Anson Richmond, b. February 24, 1790, in Taunton, d. September 23, 1834, in Salina, N. Y. M., June 20, 1820, Betsy Melvin, daughter of Captain Moses Melvin. 9. John Richmond, b. July 25, 1792, in Taunton. M., 1st, Dinah Harwood; 2d, Abigail (Skillings) Averill. 10. Sybil Richmond, b. December, 1797, in Barnard, Vt., d. 1853, at Brady, Mich. M. Darius Crippen of Salina, N. Y.
VII HATHAWAY RICHMOND, son of the preceding, was born in 1772 in Taunton, Mass. He removed to Barnard, Vt., and from there joined the migration of the Richmond Family to Salina, N. Y., in 1816. He was interested with his brothers in the manufacture of salt and had an unusual talent for business, which evidently was transmitted by him to his distinguished son, Dean Richmond. Died in 1821 in St. Louis, Mo. Married, May 4, 1798, Rachael Dean, daughter of Elkanah Dean of Taunton, Mass. She died in Salina, N. Y., in 1821, the same year of her husband’s decease. 1. Betsy Richmond, b. 1799 in Barnard, Vt.
2. Frindey Richmond, b. 1801 in Barnard, Vt., d. 1853 or 1854 in Attica, N. Y. M., 1st, at Salina, N. Y., Benjamin Babbitt of Barnard, Vt.; 2d, Augustus Chester of Chicago. 3. Dean Richmond, b. March 31, 1804; of whom below. VIII DEAN RICHMOND, son of the preceding, was born in Barnard, Vt., March 31, 1804. He received his education in the public schools. His father died when he only fourteen years of age, and the entire care of his moth(r and family and the management of the business left by hi; father fell upon the shoulders of the boy. It was at this period, at an age when most boys were yet in school, that the young Dean showed the material of which he was made. He at once took full charge of the business of salt manufacturing at Salina, N. Y., that his father had developed. With little else save the debts of the old concern and a capital composed of health and energy, he began his active life. From the outset he displayed rare capacity for business and quickly won the confidence of his associates and of the public. In less than a year the death of his mother left him altogether to his own resources. At that time the market for salt had, through various causes, become somewhat limited in that section, but the energy with which the young man pushed the sale soon extended to several new districts, particularly in the north and east, and ere long the business began to yield a satisfactory income. Prospering in this enterprise, he embarked in others, in which also he commanded success. In 1842, at the age of eighteen, he removed to Buffalo where he engaged in the commission and transporting business, dealing principally with the products of the great west. Bringing to his business operations, which had then assumed great extent and importance, the wise foresight and judgment which characterized him throughout his entire life, he laid the foundations for the success that in the course of a few years made him one of the wealthiest and most influential men in the Lake region. Before he was twenty-one years of age his exceptional capacity for affairs was so marked that he was chosen a director of the bank at Salina, and when he was twenty-one he controlled, either by purchase or lease, all the salt works in Salina. From the time that he settled in Buffalo, his business was always located in that city and connected with the chain of lakes. In 1846 he became a resident of Attica, N. Y., but still maintained his business relations with Buffalo. It was while located in Buffalo and in the midst of his active career in various lines of business that he made his first connection with railroad affairs. He became a large stockholder of the Utica and Buffalo Railroad Company, and was elected a director of that corporation. “When the direct line to Batavia was completed he took up his residence at that place, which continued to be his home for the remainder of his life, although the headquarters of his business was still retained at Buffalo. His acute business judgment and keen insight into the future gave him, far in advance of most of his contemporaries, a sound idea of what the infant railroad systems of the country would eventually become, and he early attached himself to this line of transportation development. While connected with the New York Central, the company relied most implicitly on Mr. Richmond’s judgment, and never undertook any enterprise of importance without first submitting it to him for advice and approbation. His record as a railroad man is shown in the growth of that great property while under his control and the measures which he instituted or advanced for its improvement and enlargement. No matter what honor of labor or design may be given to others in the up-building of the great Central system, a large share properly belongs to Dean Richmond and is the monument of his railroad work. He labored at a time of uncertainty, discouragement, and difficulty, and his success was all the greater from the size and variety of the obstacles that he was compelled to confront. He was original, both in his ideas and methods. To him particularly belongs the credit of being the first American railroad man to adopt steel rails. Thoroughly convinced of their utility over the old iron rails, he met with much opposition when he proposed to introduce them, but was finally able to have a few laid on trial. He was so well pleased with the results that he placed in England what in those days was considered a large order. Unfortunately, however, he did not live to see his plans carried out, for the consignment did not arrive in this country until after his death. Dean Richmond was not alone a railroad man. Actively connected throughout his exceptionally long career with many business enterprises, he was successful in everything that he undertook. A very considerable private business, to which he remained devoted throughout his life, was the shipping on the lakes, including the elevator system at Buffalo. At one time he owned large interests in the Western Transportation Company. In all business operations he had very decided views, and when once his mind was made up he adhered to his purpose with a persistence born of conviction and a firm belief in the surety of his judgment. Indeed, his judgment passed into a proverb among his associates, and was most implicitly relied upon, almost as if it had been infallible. His knowledge of business affairs was not merely intuition, although he possessed this faculty in a wonderful degree, but it was also derived from close observation and sound experience and through precision of reflection. Mr. Richmond’s devotion to business did not lead him to ignore public affairs. He considered it a duty that every man owed to his country to interest himself in the national welfare, and held that it was especially important that business men should not lose sight of the gravity of national affairs as affecting their private interests. Although never forgetting that his private interests were of paramount importance and that his duty to his associates in business was the first demand upon his time and energy, he gave close attention to politics. His political convictions were strong and were steadfastly maintained, the marked characteristics of the man being displayed in this connection as conspicuously as they were in the business relations of his life. Possessed of great capacity for work, he gave careful attention to political affairs, no matter how absorbing were his business duties. In his earlier days he led the democrats of Onondaga County to victory, and in subsequent years entered into each new campaign in state and national politics with a zest and enthusiasm that inspired all who came in contact with him. Although a strong Union man during the Civil War, he always remained a democrat, and throughout his career held the fullest confidence of the state leaders of his party by virtue of his political acumen and sound judgment in matters of public and party policy. His successful organization of the democrats of Onondoga early brought him recognition, and his ability soon made him the leader of his party in the state. His motives were so sincere and honest they were never questioned, and his views, to a large extent, were unhesitatingly adopted by his associates and shaped their policy. For many consecutive years, from about 1857 until his death in 1866, he was chairman of the Democratic state central committee, and during that period exerted a greater influence in the Democratic party than any other man in the state. His success in dominating the Democratic party in New York State has become traditional, and his name is one of the most conspicuous in the annals of the party. The Norman blood of the de Richmond’s, commingling with the strenuous blood of the Deans of Scotland in the veins of Mr. Richmond, was preeminently the source of his quenchless energy and mental vigor and masterly physique. These combined to make him one of the foremost men of his age in his chosen avocations and in the political world. In private life he displayed marked qualities of character that distinguished him quite as well as in his business and political relations. His goodness of heart was well known to all who came intimately in connection with him, and was especially remembered by many who had particular occasion to have personal knowledge of his disposition in this way. He was benevolent in a quiet way, and frequently, without being appealed to, would relieve distress in the most substantial manner. His acts of philanthropy were numerous, disinterested, and generous, and his name became as well known in New York for kindness of heart as it was for business ability and political astuteness and sagacity. In his social relations he was a good friend, kindly and genial, while in the privacy of the family circle his noblest qualities shone with a brightness that only those who came in contact with him there could best appreciate. He died in New York City, August 27, 1866. He had been living for the summer at the seashore with his family, and left there in company with his intimate friend, the Hon. Samuel J. Tilden, to attend the democratic convention at Saratoga. After the convention, in company with Mr. Tilden, he went to Philadelphia and Washington and returned to New York August 18. At Mr. Tilden’s city residence in Gramercy Park, on the following day, he was taken seriously ill and died in a little more than a week. Married, February 19, 1833, in Troy, N. Y., Mary Elizabeth Mead. Mrs. Richmond was born in Troy, N. Y, June 21, 1813, and died in Batavia, N. Y., April 6,1895. Her father was Hathaway Mead and her mother was Electa Danchey or Danchier, of an old French family of distinction. Mrs. Richmond was a woman of sterling qualities of character and developed very marked business ability. After the death of her husband, she managed skillfully and successfully the large properties that were left by him. 1 Alfred William Richmond, b. October 1, 1836, in Syracuse, N. Y, d. November 17, 1881. M., 1st, in May, 1857, Mary L. Soper of Batavia, N. Y., who d. in September, 1874; 2d, in December 1875, Rosalind C. Morse. By his first wife Alfred William Richmond had, i. Catherine Richmond, b. November, 1858, d. September, 1859. ii. Dean William Richmond, b. February 19, 1860, m. Carrie Gale of Pontiac, Mich. By his second wife he had, iii. Rosalind A. Richmond, b. September, 1875; an accomplished pianist, violinist, and musical composer. 2. Harriet Richmond, b. October, 1838, d. August, 1839, at Saratoga Springs, N. Y. 3. Henry Augustus Richmond, b. August 3, 1840, in Syracuse, N. Y. He was at one time a civil service commissioner for the state of New York. 4. Adelaide R. Richmond, b. June 7, 1845, in Syracuse, N. Y. She resided in the old Richmond homestead at Batavia, N. Y., where she d. February 7, 1905. M., February 2, 1869, Dr. W. J. C. Kenny, who d. June 1, 1873. He was treasurer of the Buffalo Courier Company. 5. William Eugene Richmond, b. August 12, 1848, at Attica^ N. Y., a resident of Buffalo. M., February 2, 1872, Clara Nuns” of Buffalo. Issue: i. Watts Lansing Richmond b. April 29,1873. 11. William Eugene Richmond, Jr., b. April 29, 1875. iii. Adelaide K. Richmond, b. January 24, 1877. iv. Harold Richmond, b. September 19, 1878. v. Clara Richmond, b. April 24, 1880, d. May, 1883. vi. Francis Nims Richmond, b. September 9, 1887. vii. Dean Richmond, b. February 20, 1895. 6. Edward Gould Richmond, b. October 29, 1851, at Attica, N. Y.; graduated from the Racine College in 1874, and from the law department of Columbia College in 1878; became a banker and a widely known manufacturer and was president of the Chattanooga (Tenn.) Oil Company and of other large manufacturing interests. He was known throughout the south as one of the leading manufacturers and as a philanthropist, and was a gentleman of rare culture, nobility of character, and generosity of heart. D. November 29, 1903. M., June 19, 1889, Carrie Pfau of Cincinnati, O. Issue: i. Edward Dean Richmond, b. April 7, 1892. ii. Ruth Dean Richmond, b. February 12, 1896. 7. Edward Dean Richmond, b. October 29, 1851, in Attica, N. Y., d. September, 1852. 8. Dean Richmond, b. October 30, 1853, in Batavia, N. Y., d. February 2, 1885, in Batavia. Unmarried.